Manju Pattabhi Jois - Saving traditional yoga from "the circus"
In a world where selling yoga pants can make you very, very rich, 71-year-old Manju Pattabhi Jois follows back to the “old school” gurus — those who choose their students rather than the other way round. Any big city yoga franchise would blissfully welcome the world-travelling master of Ashtanga yoga, but he’s at a small studio in Whistler last weekend because its owner made an annual journey to his father’s school in Mysore, a city in southern India, for 15 years running. “You have to have had a relationship with him personally or his father. People have offered him lots of money and he’s not interested. He just goes to his students and I’m a long-term student of his,” Tina James, owner of Loka Yoga in Whistler, said Friday. James, originally from London, England, said 20 yoga instructors and 40 yoga practitioners filled the spaces for Jois’s five-day visit as soon as it was announced. People have come from Germany, the U.S., the U.K. — “yoga stalkers,” as she affectionately calls them. Manju Jois is the son of K. Pattabhi Jois, the founder of the Ashtanga school of yoga, which has transformed into the yogic practice of choice for celebrities like Gwyneth Paltrow, Madonna and Sting. The death of K. Pattabhi Jois at the age of 93 in 2009 was noted around the world because of his reputation as the master of a form of yoga that incorporates a series of poses performed with slow, rhythmic breathing that has spawned offshoots such as vinyasa, flow and jivamukti yoga in the West. 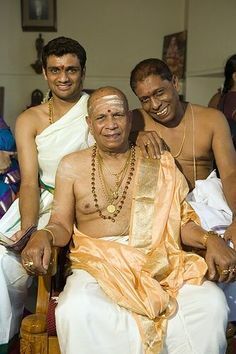 Ashtanga yoga guru K. Pattabhi Jois with son Manju (right) and grandson Sharath, who teaches yoga in Mysore, India, and is a partner in the U.S.-based Jois Yoga schools. The eldest Jois died in 2009. Manju Jois represents himself with an abbreviated web presence that includes a short biography (he began early morning yoga with his father at age seven; started teaching at 15) and a link to where he will appear next. This week Whistler; next month Halifax, then the U.S. and Brazil; Italy and Germany in June.